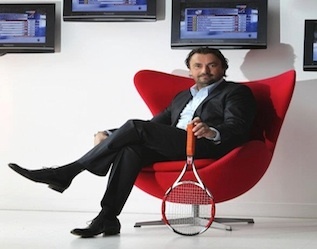 Henri Leconte loves New York. Great. Since Monday, the former French Open finalist is a consultant on Eurosport on his own show: Avantage Leconte. In this talk show, he does not mince words. What characterizes the US Open? This is the last grand slam, the last tournament of the season. Everybody is tired and the fact that it is played on hard court does not facilitate the task. In Australia, everybody is totally relaxed and the spectators are thrilled. Roland Garros is on clay and has a lot of charm. Wimledon has rules, regulations and lot of tradition. No room for improvisation or creativity when it comes to outfits. All outfits should be white. At the US Open there is something special: You eat burgers, fries. In fact you eat all day. It is a great show and only the Americans have the recipe to do it that way. How do they live Tennis? They scream and it's fun- The music is omnipresent. And the airplanes too. This is the US Open. It remains a crazy tournament. It is complicated. They are under extreme pressure and their surroundings do not make things easier. But above all, social networks have significantly stopped any emotions and communication. They are all afraid and do not say anything. How is it that tennis has no doping issues? Because at tennis, there are a lot of controls. There were a few issues in the past but it's true that in this sport everything is under control. Some crossed the line and they were punished. We must be strict on this. 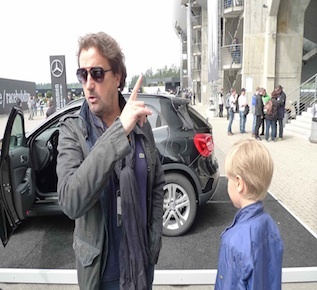 Together with Bernd Mayländer, Formula 1 Safety Car driver and Mercedes-Benz brand ambassador, Henri Leconte tested the winning car last Saturday at the Hockenheimring and was impressed by the dynamism and power: "Whoever will win this car - he can not drive! Therefore I decided to keep this car, " joked Leconte.